Old City Hostel located in the heart of the city. Our balconies overlook the central area of Lviv and have a wonderful view of the world-famous Theatre of Opera and ballet. Inside hostel personal offers family and multi-bed rooms, all of which are new, clean and well groomed. Guests will always be informed about all events, including city celebrations, festivals, nightlife and family events happening in Lviv. All this, together with friendly staff and full of comforts (free Wi-Fi, security, cabinets, etc.) will make your stay in Lviv unforgettable! Old City Hostelwas opened in 2010. It was designed for 46 places with the possibility of accommodation in different rooms. In 2016 hostel has been modernized: repaired showers, re-equipped and upgraded kitchen and general recreation area, also made repaires in some rooms. Hostel has 3 toilets with showers and a kitchen equipped with a stove, the kettle, a microwave and a refrigerator. Tourist Information - tips, maps, information about interesting events ect. It is possible to organize transfer to the hostel. When you do your reservation consider that one of the rules of the hostel is a prepayment of 50% of the total amount of stay. For prepayment details we send mail to the guest and ask for prepayment within five days. Had a great time at this hostel, staff was great and always willing to help. Great place great staff, the best location, right in town yet quite. 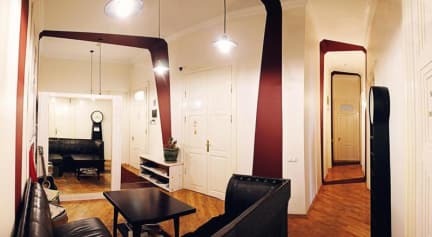 An excellent hostel in one of the best locations in the middle of Lviv old town. The staff were really helpful with all of our questions and we're happy to help out with any advice. The hostel was clean and tidy, but did have a quiet atmosphere. Great location, Nice Staff and Nice beds. There wasn't much atmosphere, and the refrigerator had a horrible smell. Overall it was a nice hostel and an amazing location. Not much interaction amongst guests. Staff seemed to have no interest interacting with guests either. A bulletin board with recommended sights and places to eat/drink would be helpful. The location was excellent. Hostel was clean, helpful staff. There is unfortunately atmosphere among guests. Overall a quite good choice (as i mentioned, location is quite good) in Lviv. There is no air conditioning in the rooms,so the only way how to get fresh air is to open windows, but it is hard to sleep like that because from the street you hear incredible noise. You have to do your bedding by yourself, I dont like that. 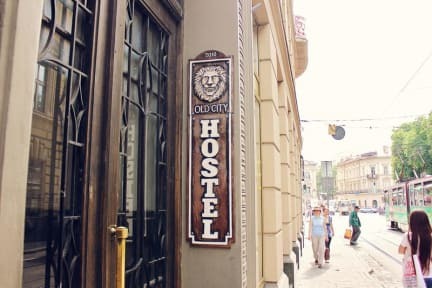 It was hard for us the hostel even find.The only sign of the hostel is billboard on the balcony but it wasn't visible at night.You say Old city hostel is the best hostel in Lviv,for me it was pretty average so I am curious how the other hostels look like. The receptionist was borderline rude. It was so hot in my room that I couldn't sleep for two nights. The walls were so incredibly thin that you heard EVERYTHING in the, so when your neihbours start playing music at 3 am it's like were actually in their room. My room was was facing a very busy street so it was incredibly loud - contributed to me not being able to sleep for two nights.